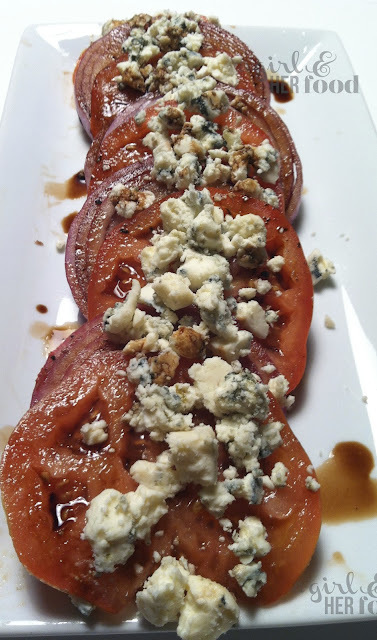 Tomato, red onion, and Maytag Blue cheese salad is simple,but is packed with lots of great flavor. I love to serve this delicious salad along with a great grilled steak. Steve and I made this salad for Bobby Flay, on Food Network's Bobby's Dinner Battle, along with a grilled flank steak. However, it was edited and not shown on TV. You have to make sure you are working with a ripe and seasonal tomato since they are the "star" of the salad. You can serve this salad layered (shown above) or tossed. As both the onion and blue cheese can overpower some palate, feel free to change the amount use depending on your taste preference. Cut the tomato and red onion with the same diameter or thickness. Place one slice of tomato on one end of your serving dish. Layer a whole slice of red onion on top, slightly offset. Repeat for the remaining slices of tomato and onion. Season with salt and black pepper, to taste. Drizzle with the balsamic vinaigrette. Crumble the bleu cheese on top. Serve immediately. Cut the tomatoes in bite size chunks and thinly slice the red onions. Toss the tomatoes and onions in a bowl along with the balsamic vinegar, salt & pepper. Top with the crumbled blue cheese. Enjoy! Something at my skill level, yay! Looks really good! I recently purchased a bottle of 18 year old balsamic. I can't wait to try this recipe as soon as the heirloom tomatoes are ripe. What a lovely way to show the simple beauty of a red ripe tomato! That, however, is about to change. Starting in January, a new state law will require doctors to. At least that appears to be the message coming from Pence allies, and perhaps the vice president himself, as the Trump White House reels from a series of interlocking scandals that threaten all manner of political. She also held the German national record in the 100 meter butterfly.Julia was a member of the UCLA Women's Swim Team on full athletic scholarship from 1998 motorcycle t shirts to 2001. During that time she won numerous races and set several team records.Currently Julia holds the UCLA record girls unicorn shirt in the 100 meter butterfly (short course), UCLA Bruin Masters swim records in the 25 29 age group in 50, 100, and 200 fly, and the 100, and 200 IM in short course meters, and also 50, and 100 fly, and 100 IM in short course yards.Since 2004, after graduating from UCLA, Julia has worked as an assistant coach for the UCLA Bruin Masters Swim Club. She has many years of experience as both a lil uzi shirt swimming coach and a swimming instructor for individuals of all ages and skill levels.